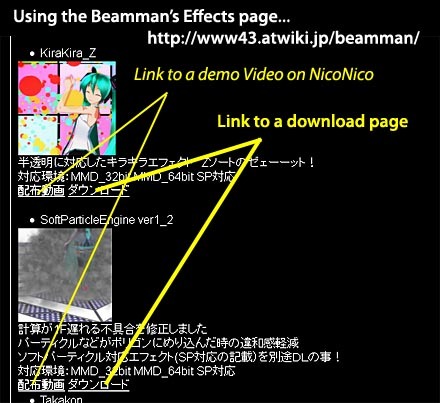 Where can I download Beamman’s Effects? 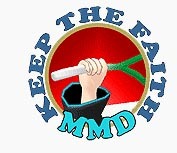 What do I click to download Beamman’s MME effects. How do I find what to click on those Japanese pages? The trouble for many first-timers is figuring out what to click on and then… what’s next… is this new page OK… is it normal? The answer is probably “yes”… clicking a link on Beamman’s page sends you to another page where you must click a link and then you are sent to a THIRD page which loads and remains on-screen while the actual download takes place. So… go to the Beamman page… and I use Control-f to FIND a particular effect… or just scroll down until you see the one you want. Of ALL the stuff on that page, all you really want to do is click that download button at the bottom of that screen. 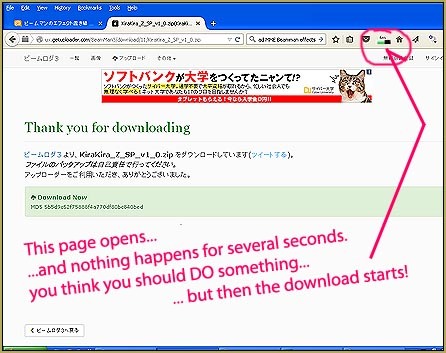 … it SEEMS like you should click on something to start the download … but do not… just wait until your download begins… and then keep that window open until the download is complete. There you go… a quick tutorial about getting into Beamman’s Effects!